A few weeks ago, I joined some plant-based food groups on Facebook to help come up with new foods for our diet. Several women shared their different versions of Garlic Roasted Garbanzo Beans as a snack option. Since it is also a great idea that is lower in SmartPoints, I decided to test it out for myself. The result was pretty amazing! This post contains Amazon affiliate links. Purchases made via those links may earn me a small commission. First off, I heard that these would be similar to corn nuts in texture and flavor. While I can see the similarities, they are not as close as I would have hoped. They are, really yummy though, and an excellent way to sneak in a healthier snack option that packs lots of protein. As I am reaching for snacks to fill in gaps during my busy days, these are something I will be making on a regular basis. Pat garbanzo beans dry, pour into a large bowl. Toss with olive oil, salt, garlic powder, and paprika until all are well coated. Bake at 375° for 20 minutes. Turn chickpeas so they are evenly roasted (use a spatula to flip them or simply stir around but make sure they are in an even layer). Place back in the oven at 375° for additional 25 minutes. Allow the roasted garbanzo beans to cool before storing in an airtight container for snacking. While this easy vegan treat is a great option for those on a plant-based diet, it may not fit into all Weight Watchers meal plans. A 1/2 cup serving is a large serving, but you could easily add just a few to a salad, or into a trail mix with pretzels or popcorn. 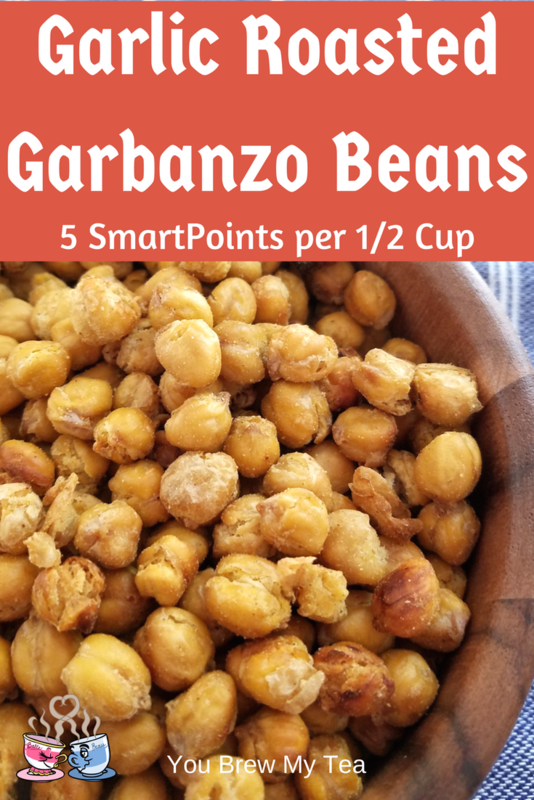 I measured the SmartPoints for these garlic roasted garbanzo beans using the recipe builder on my own personal Weight Watchers dashboard. You can also find the points in recipes by using the Weight Watchers SmartPoints Calculator purchased from your local meeting location or online via the link above. We’ve shared a ton of great easy Weight Watchers recipes here in years past, and some of our favorites are listed below. 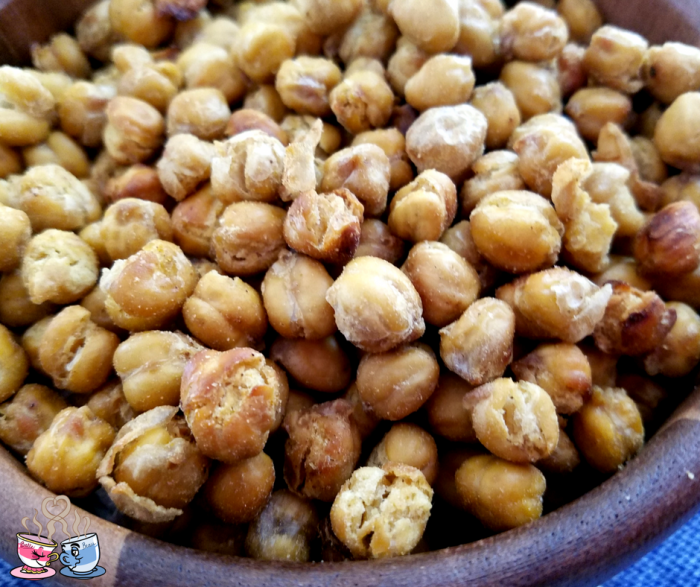 Alongside this roasted garlic garbanzo beans recipe, I can recommend adding in fresh fruits, raw veggies, hummus, and pretzels as a great lower point healthy option for Weight Watchers diets. You’ll find some of our favorites listed below. Note, not all of these are plant-based, but you will find great ideas for SmartPoints snacks! Roasted chickpeas are such a great healthy snack! I’ve never tried them with garlic powder, I’ll have to try this! I love this easy recipe of chickpeas. What a great snack to enjoy! Thank you so much for sharing at Fiesta Friday table this week. What a easy and healthy snack. Love garlic in anything and this looks like a perfect way to use it. I will love your Garlic Roasted Garbanzo Beans! Hope you have a great weekend and thanks so much for sharing your post with us at Full Plate Thursday! These look good – Pinned! are the 5 smart points before the freestyle…I get 1 SP for the entire recipe. Hi Barbara – The FreeStyle program says that roasted chickpeas are not zero points. Since they are considered a snack food, you do have to count them.